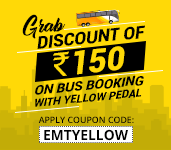 Why EaseMyTrip for Bus Booking? With simpler and smarter way of online bus booking at EaseMyTrip.com, be ready to travel any destination of India. We list more than 10,000 bus routes across India and provide great facility of online bus reservation. Explore the wide options of buses and choose to travel with Volvo buses, luxury buses, AC/Non-AC buses, sleeper buses or several other buses at reasonable rates. Best discounts and cash back offers are available on bus ticket. Be free from standing in the long queue of bus counters and go for bus booking online with EaseMyTrip.com. Be sure for a memorable & secure journey!